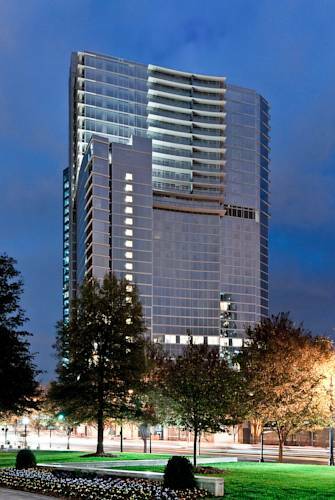 Loews Atlanta Hotel - located in the heart of Midtown - welcomes guests to an epicenter of style energy and culture. Located in the heart of the Arts District and surrounded by the citys best dining cultural attractions and only minutes from downtown and Buckhead. 414 luxurious guest rooms including 44 spacious suites with breathtaking city views. Hotel features Exhale Spa. 40000 sq ft of flexible meeting space and the lively Saltwood Charcuterie and Bar. SALTWOOD Charcuterie and Bar: Saltwood located inside the Loews Atlanta Hotel is Midtowns newest small-plate-style restaurant. Market eleven: Our boutique market is stocked with freshly prepared foods Starbucks Coffee and Loews house-made pastries. At 1065 Peachtree Street Loews Atlanta Hotel is the centerpiece of 12th and Midtown - an exciting new urban oasis at the center of the vibrant 14 block Midtown mile. In the heart of the Arts District its surrounded by the citys best shopping dining and cultural attractions and is just minutes from downtown and Buckhead. 20 minutes from Atlanta-Hartsfield Jackson International Airport. 5 minutes from Amtrak station and 2 minutes from Midtown MARTA station.